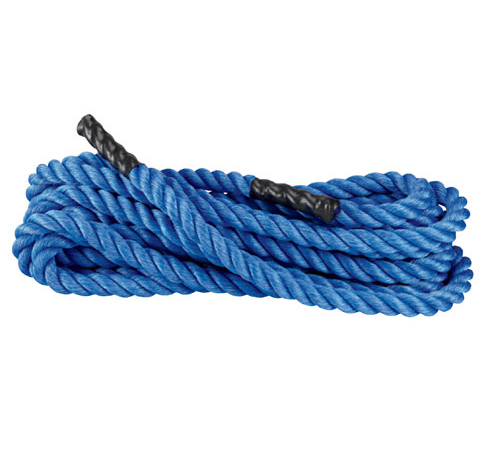 These danline ropes are the best choice for a gym or indoor training (can be used outside also). A Battling Rope is more durable and has a greater life span than a manila training rope. They are braided danline and do not shed, and are non-abrasive making them perfect for indoor use. Battling Training Ropes feature a plastic boot on each end to prevent fraying. As you train with the Battling Ropes, you will get a great aerobic workout. You are in control of how hard and how long you workout. You will quickly notice how Battling Ropes Training will transfer into your sport or activity. You will not only have a lot of fun with your training, but you will also find yourself more motivated in general. This is due to the increased physical and mental discipline you will gain. *Shipping within the United States only. Battling Ropes no longer ships outside the United States. ©Battling Ropes, 2012. All Rights Reserved.